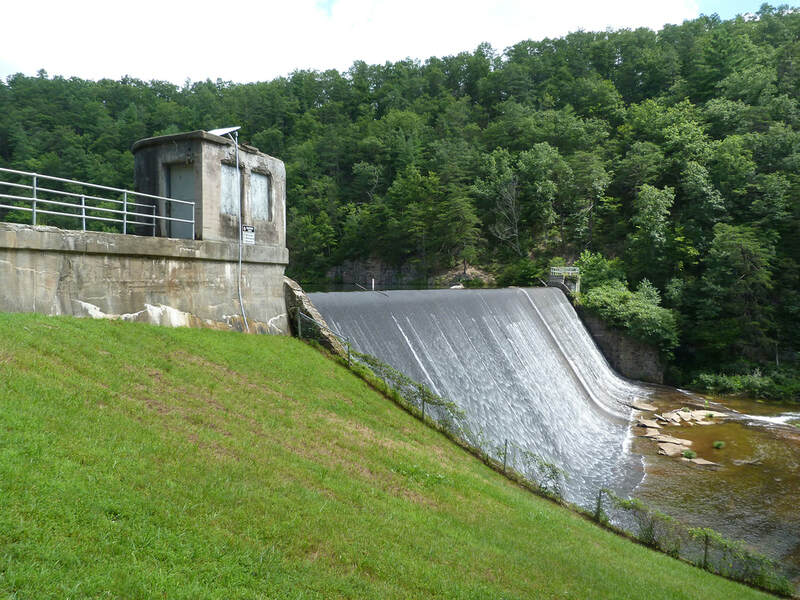 When the flood hit, 80 Augusta County 4-H Club members and staff were near the end of a week-long camp at the North River Recreation Area, just below Staunton Dam. The camp site was the former Camp Tracy/North River Civilian Conservation Corps Camp. Rescuing the 4-H Campers quickly became a top priority that involved multiple efforts from multiple directions. Among the campers were Mike Twitchell of Stuarts Draft and Bootsie Graham of Deerfield, both 13 years old. Bootsie’s father Hugh Graham worked for the Deerfield Ranger District of the George Washington National Forest. Mike and Bootsie didn’t know each other at the time, but years later met and married. According to their recollections, they had been at camp all week, doing arts and crafts, playing games, and engaging in all the normal 4-H Club camp activities. ​When the water started to rise on Friday afternoon, the leaders quickly gathered the campers in the dining hall and fed them sandwiches. During the time it took to eat, the area around the dining hall had already flooded with 2-3 feet of water from the North River. With rain still pouring down, the campers waded through rising water and climbed on school buses that were already there to transport them home after camp ended on Saturday. Of course they could not cross the flooded North River as the water was raging and the roads were washed out. The leaders drove the buses up a forest road (FR 425) to higher ground on a flank of Hankey Mountain. According to Mike, fallen trees across the road prevented them from going very far, but they were well above the reach of the flood waters. Mike and Bootsie recall being soaking wet and miserable as they spent the night on cold metal bus seats. All communication with the outside world was lost, with no way to let parents know the campers were safe. 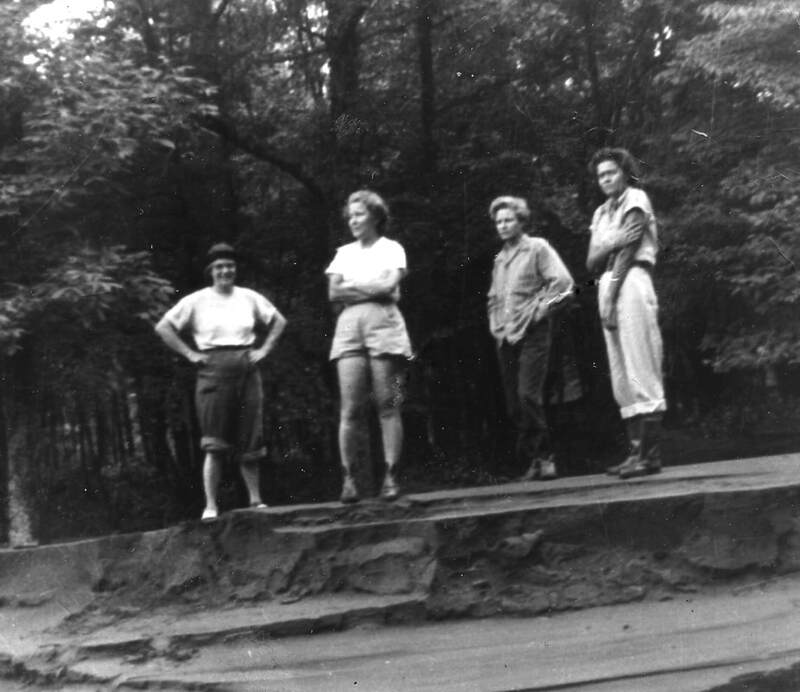 The former North River CCC Camp was used by Augusta County 4-H Club for summer camp in 1949 and for several years prior to 1949, but never again after the flood. Photo courtesy of USFS. With this effort being unsuccessful, rescue workers started over Hankey Mountain on foot to reach the camp. Meanwhile the sheriff went by car to find passable roads via Jennings Gap and what we now call Braley Pond Rd. in an attempt to reach the camp from a southern route. He was stopped by a washed out bridge about 4 miles from the Camp. He radioed back to bring the duck to that point. The “duck” shoved off at about 2:00 p.m. on Saturday to make the 4-mile trip to the camp. Parents waited anxiously at the washed out bridge, thankful to have help on the way to their children. Rescuers in the duck found the camp in shambles and three camp leaders on high ground. The leaders recounted that the campers had spent the night in buses and cars and that Saturday morning the cooks went back to camp to prepare breakfast. An overland rescue team from Stribling Springs showed up on foot at 11:30 a.m. When the “duck” rescuers arrived, the overland rescuers had the 4-H children lined up and ready to embark on a 5-mile hike to Stribling Springs. Seventy-four of the eighty, including Bootsie and Mike, walked over the mountain. It was not an easy trip. With normally small streams running high, and the adults had to form human chains to help the children across. When they arrived at Stribling Springs, they were transported to their homes and reunited with their parents. Augusta County 4-H Club had held summer camp at North River for several years, but after their experience with the flood, they decided to move their summer camp to Albemarle County. Since the flood, all the CCC Camp buildings have been razed, but one. The site is now North River Campground, which is popular with fishermen, hunters, hikers, and other recreationists. Hugh Graham, Bootsie's father, worked for the Deerfield Ranger District and did restoration work after the flood. 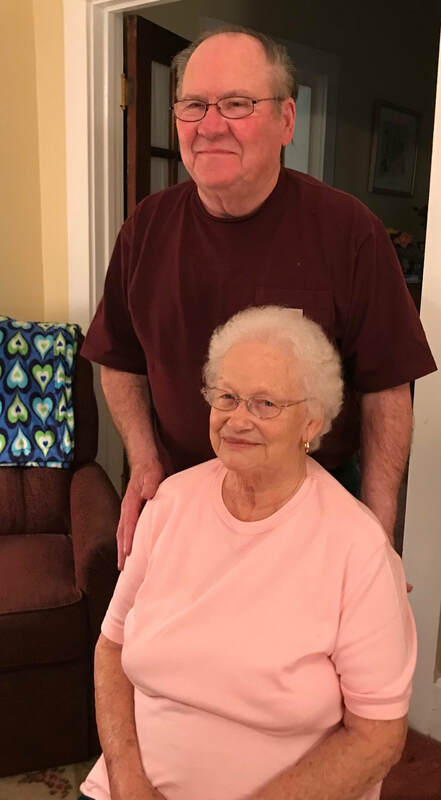 Photo courtesy of Bootsie Graham Twitchell. 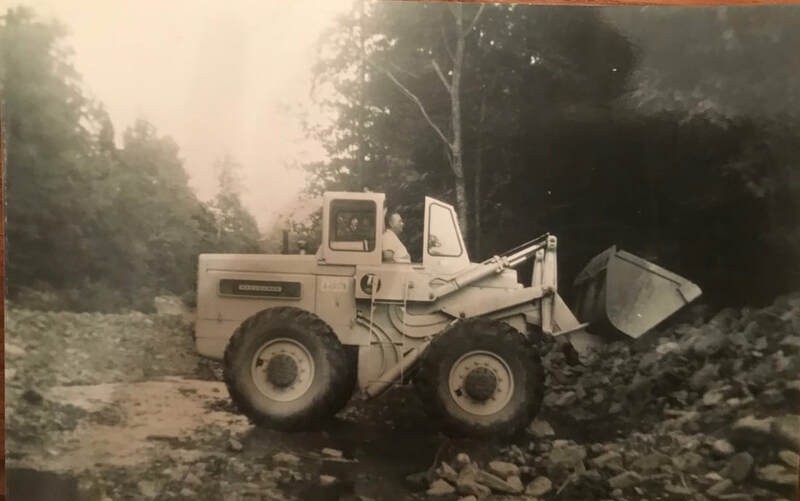 Bootsie’s father helped with the extensive work that was done in the National Forest after the flood. He helped install gabions to stabilize the banks of the North River and prevent erosion. Gabions are wire baskets filled with stone. These can still be seen along the banks of the upper North River. Today the overland route from North River Campground across Hankey and Lookout Mountain to Camp May Flather is now Wild Oak National Recreation Trail. A side trail, Bear Draft Trail, connects to Stribling Springs. These trails are popular with hunter, hikers, and mountain bikers. 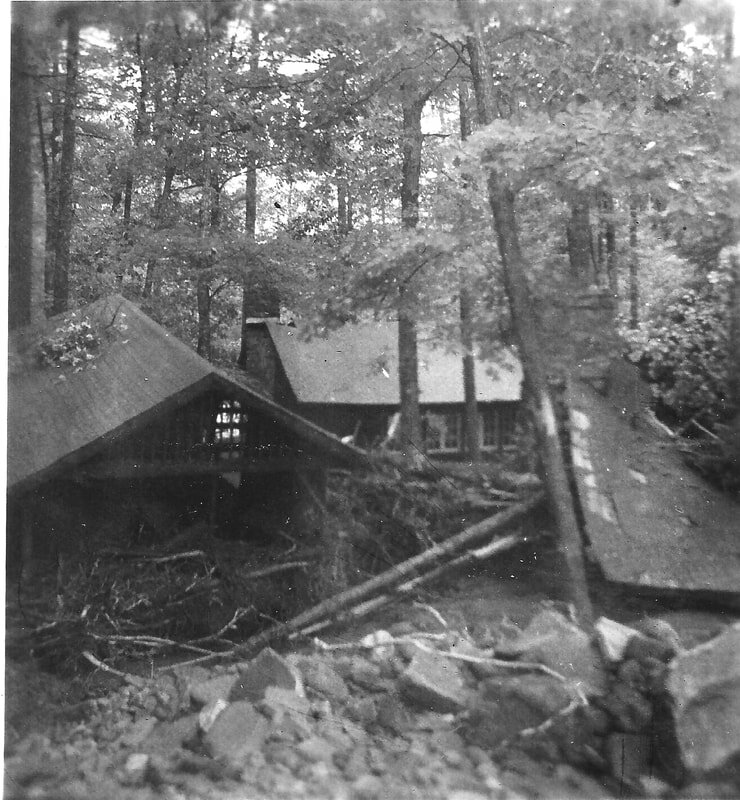 The Boone Unit of Camp May Flather was badly damaged by the flood. Only the chimney remains today. Photo from Girl Scout History Project. Built in 1930, Camp May Flather, the District of Columbia Girl Scout Camp, is situated on 50 acres of National Forest land on the North River, a mile upstream from Stokesville, The North River runs through the center of the Camp. When the flood hit on Friday, eight counselors and other staff were already at the Camp preparing for the Scouts to come on Saturday. Fortunately, the Girl Scouts had not yet arrived. With North River at 15 feet above normal, the floodwaters washed a third of the camp structures off their foundations and marooned the counselors in the dining hall. The Boone Unit, which had eight cabins, was destroyed with only one chimney left standing. That chimney still stands today, a reminder of the flood. A small airplane flying over spotted the stranded counselors and dropped them some food. They were evacuated Sunday afternoon after the waters had receded somewhat, but they still had to climb over debris, wade through chest-deep water, and walk a mile to Stokesville. Girl Scout Counselors stranded at Camp May Flather with the road washed out. Photo from Girl Scout History Project. "Heroic Efforts in High-Water Areas Numerous; 4-H Campaign Main Job." Staunton News Leader, 20 June 1949. Twitchell, Bootsie Graham. Personal interview. 23 April 2018. Twitchell, Mike. Personal interview. 23 April 2018.